This thing devours all things. All man, all beasts, all flowers and trees. Even the fiery sun, and the shadowy moon, will one day be devoured by this thing. Stone it grinds, metal it bites. And it shall make wood rot. Is it powerful? Well it is rather not, but it kills powerful things a lot. Its immortal yet it is not some type of god. What is it? 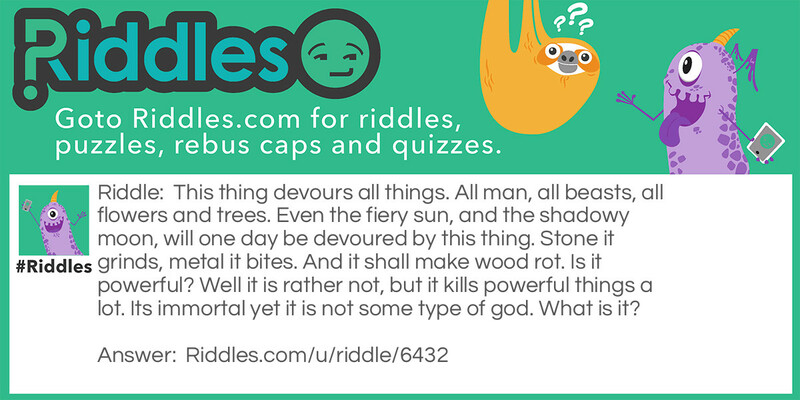 The Devourer Riddle Meme with riddle and answer page link.